The 5m/16ft Auto-Lock Measure Tape is an effective tool for large-scale measuring. Specifically tailored to the construction and interior industry, it has a custom-built and easy-to-use design. The bright yellow tape is fully retractable, rolling compactly inside a large and well-padded case body. While being easy to see at a distance, it also features bold black and red numerical markers, guaranteeing a clear reading every single time. The bulky rubberised case provides the perfect storage location. The body gives it durability for rigorous transportation while protecting the precious measuring tool inside. 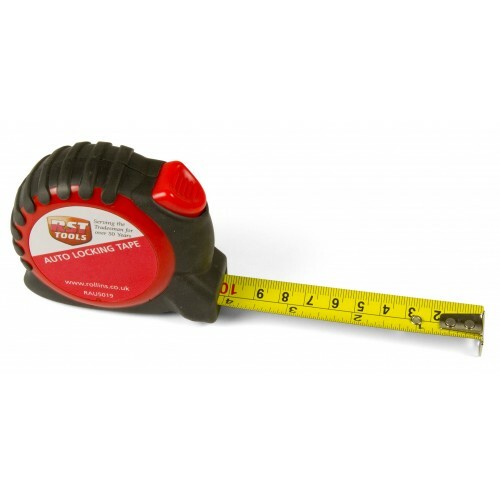 When extended fully out, the tape measure can be locked into place and used to measure up to 5 meters in centimetres or 16ft in inches. For large-scale measurements, this allows you to take accurate readings from all angles, without having to hold the tool in place. At the end of your task, the large red button releases this hold. Our auto-lock measuring tapes are a strong and entirely reliable tool. We use the strongest materials throughout, meaning it can be used every single day. Here at The Ruler Company, we understand the need for measuring equipment that meets your daily requirements. Every single one of our designs aims to meet these needs, depending on the environment it is likely to be exposed to. We also have options for large, bulk orders. Here, we have a minimum order of 100 which will drop the individual product price down to just £4.28.